Imagine designing a thermostat with ants. Seriously, try to get your brain to focus on how to solve when to turn the furnace on using ants. 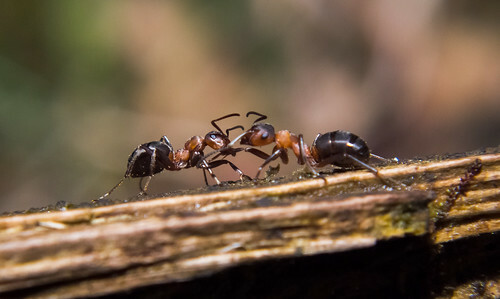 If you’re like me, our brain just sits there and says, “with ants!? WITH ANTS!?”. Then responds, “let’s solve the problem without ants.” Read: one where we already know the solution. Welcome to the cheat solution – loved by lazy brains everywhere. It’s hard to think about “impossible” problems and so we’d rather just dream of not having those constraints. What if we had a million dollars? Feels better doesn’t it. Many times we spend an inordinate amount of time trying to fight the constraint instead of digging in and searching for the creative solution — solutions that change the game and make it so we no longer care about the constraint. All creative solutions come from constraints that are imposed upon us. It’s not creative to eliminate the constraint. This is the solution everyone sees. Unfortunately, our brain screams that the constraint is the problem. If we just spend more money, or more people, or more time, then this problem is easy to solve – just remove that obvious constraint. Every enterprise, big or small, lives constrained by resources. Instead of dreaming about the constraint being eliminated, search for new solutions given the constraint. Make the constraint worse, what if instead of ten thousand dollars to spend on this, I only had 10 dollars… now what? Constraints will drive us to think of awesome ideas that we would not have found otherwise. We may not always be able to find a solution given a constraint – I’m not sure I can design a thermostat with ants – but instead of railing against the constraint, we should force ourselves to look for a new solution that lets us live within the constraint and changes the game. Don’t give in to the cheat solution.